Most Americans remember John F. Kennedy as a great man and president. Since his assassination, history has forged a public perception of the president: an immutable facade. Those left after Kennedy’s death shaped his legacy, Jackie Kennedy among them, the loyal wife of a president who wasn’t loyal to her. In “Jackie,” director Pablo Larrain hammers the idea that history is shaped by perception rather than reality. At the center of this history is Jackie, a psychologically broken woman obsessed with how history will remember her family and her husband. While “Jackie” is held up by a strong performance from Natalie Portman, who transforms into the titular character, the film fails to reconcile its theme with its story, a vacuous endurance test with no clear payoff. Taking place in the days following President Kennedy’s assassination, “Jackie” is told in an episodic, non-linear fashion which races between past and present, replicating the trauma that first lady Jackie Kennedy experienced as she relived those horrifying final seconds of her husband’s life over and over again. Larrain mixes iconography with unease, such as the scene of Kennedy’s motorcade filmed from Jackie’s perceptive. The scene’s attention to visual detail invites the audience to peer into Larrain’s visceral interpretation of the final seconds of Kennedy’s life, a historic moment that has only been witnessed on grainy newsreels. Here, the film conveys that history is merely an interpretation of an unknowable reality. Through its many close-ups of Jackie’s sorrowful face, the film conveys emotion through the visual language of faces. Here, Larrain depicts the distinction between the first lady’s public and private life. While the story of the events following JFK’s assassination is told through dialogue, the story of Jackie Kennedy is told through close-ups. Larrain shows, not tells, the wreckage of Jackie’s psyche through the tears in Portman’s eyes and the blood splatter on her cheeks. These close-ups focus the story on Jackie, with everything else being background noise. 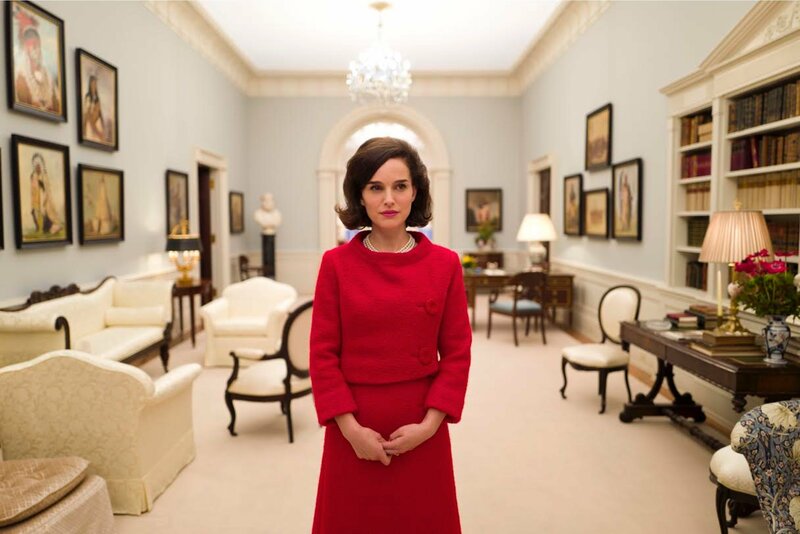 Thankfully, Portman’s incredible portrayal of Jackie Kennedy is strong enough to make even an image of her troubled eyes compelling. Toward the end of the film, Robert Kennedy, Jackie’s brother-in-law, sulks at the thought of how little his brother’s administration actually accomplished. No matter how history perceives the former president, the reality of his accomplishments can never be changed. But Jackie seems to concern herself more with appearances. One of her main achievements as first lady was her effort to restore and bring historical artifacts into the White House. She understood that although the project would accomplish nothing real, people needed to understand that “great men lived here.” And similar to how Jackie is concerned with surface-level appearance, “Jackie” is a surface-level film. During the film’s final scene, Jackie wanders through the empty halls of the White House. Here, Larrain obsesses over detail, painstakingly showing us the house that great men lived in. Although much is shown, nothing is said, summing up a film whose focus on surface-level appearances prevents it from depicting anything honest or true. Rather than insight, we are left only with flat images whose traces will soon fade from our memory.